Sea sponges live on the floor of the ocean. They are a renewable resource with many uses throughout the home. Their soft, natural feel makes them a great choice for makeup application, car care, and personal hygiene. There is an enzyme which occurs naturally within sea sponges to inhibit mold growth. Despite the enzyme, mold and bacteria can still grow within your sea sponge. Cleaning it regularly can help prevent this, and it is a very simple process. Fill a container with equal parts of hydrogen peroxide and water. This solution will clean your sponge and also restore the natural color in the event that your sponge becomes discolored from normal use. Let the sponge soak for approximately an hour, or until the natural color is restored. Rinse the sponge thoroughly after soaking to flush out any peroxide which may still be in the crevices. Soak your sponge in a solution of warm water with a few drops of Tea Tree oil after cleaning to help keep it free of bacteria. Tea Tree oil is used in many applications as a germicide, and will prevent bacteria growth. 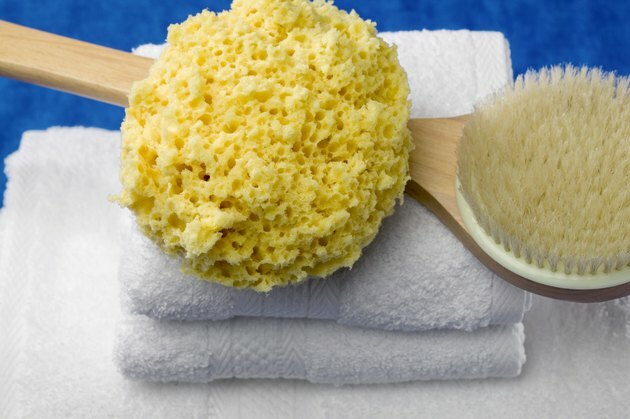 Allow the sponge to rest for 30 minutes in the solution for the Tea Tree oil to be effective. Rinse your sponge well and allow it to air dry completely before using it.